Who's your favorite Stan Lee character? In honor of Stan Lee, who died earlier today at the age of 95, we’re celebrating the comics icon’s many world-famous creations by asking: Who’s your favorite character co-created by Stan Lee? When I first started reading comic books, I gravitated toward serious or grown-up superheroes like Batman and Superman—though that might have been because those were the heroes my older brother, who owned all the comics in the house, liked best. But the first masked crimefighter I really connected with was Peter Parker, a.k.a Spider-Man. Mouthy yet introspective, superpowered yet awkward, Spider-Man was relatable, cool, and most important, young. No Marvel character better captured adolescence (granted, this was before I discovered the X-Men): the changing body, the growing responsibilities, the angst. Peter, and by extension, Spider-Man, has grown up, both on the page and on screen, all of which I’ve followed the character through (even the not-so-Amazing reboot). There’s some dispute over the extent of Stan Lee’s involvement in the creation of the character, but even if he was only behind the decision to make Spidey a quippy young upstart to tap into the teen market, his youth remains an essential part of his appeal—and it’s why the teen comedy angle for the latest cinematic reimagining felt very much like a Homecoming. Internal conflict is at the core of so many Stan Lee characters, and I don’t know if it gets more extreme than the dynamic between Bruce Banner and The Hulk. Created by Lee and Jack Kirby, the Hulk is a metaphor for the dangers of the atomic age, a monster unleashed when a scientist finds himself in the middle of a gamma bomb explosion. He’s also a physical manifestation of Bruce Banner’s repressed rage, and Hulk is one of the best examples of how the superhero genre takes specific human emotions and blows them up to spectacular proportions. The Hulk is a part of Banner that breaks free with destructive force, and as someone with a tendency to bottle up emotions until they explode, I admire the primal simplicity of the Hulk’s concept. There’s definitely an element of wish fulfillment in the Hulk for readers that wish they could let themselves fully give in to their anger—my appreciation for the character developed during my closeted teenage years—but Lee and Kirby were clear early on that this was a curse for Banner rather than a gift. The current The Immortal Hulk series showcases the brilliance of this original horror angle for the character, which distinguished Hulk from the slew of other characters imagined by Lee and his collaborators at the start of the Silver Age. Spider-Man is the go-to example when talking about Stan Lee’s ability to imbue his characters with realistic fears and relatable concerns, but there’s never been a superhero that really speaks to my own fears and concerns like Daredevil. I tend to get overly invested in the idea of justice, that bad people will someday really get their comeuppance for being bad, and Daredevil has proven many times that he’ll sacrifice everything just to hold onto the belief that justice is a real thing that’s worth protecting. Maybe it’s because I was raised Catholic like Matt Murdock was (with all the guilt and atoning for sins that comes with it), but I find it uplifting to see a guy who keeps getting kicked around by life continue to put on the mask and go out to beat up Stilt-Man every night—not because he likes to fight but because it’s simply the right thing to do. Although his place at the top of Marvel’s cosmic food chain has been displaced by various newfangled usurpers over the years, you just can’t beat Galactus when it comes to top-level MU threats. Literally: Lee and Jack Kirby designed the ever-hangry space wanderer as a threat that their Fantastic Four couldn’t defeat by force, essentially asking the question “What if God showed up on your doorstep and said he was finally pulling the plug?” It’s only through the intervention of his erstwhile servant the Silver Surfer—and a little clandestine extortion from Uatu The Watcher, another Lee MVP—that the Big G agreed to back off from his initial plans to devour the Earth, returning periodically to threaten humanity (and drive up sales in the process, because Stan Lee knew a keeper when he saw one) . But the genius of Galactus’ M.O. is the way it takes the Marvel approach to character—always human, even for the inhumane—and expands it to the wielder of The Power Cosmic himself. Galactus’ motivations aren’t cruelty, or power, after all, but hunger. Guy needs to eat, just like the rest of us, and it’s very Lee to find something so recognizable in a character who’s essentially the apocalypse in a big goofy purple hat. J. Jonah Jameson can be a craven heel, and that’s exactly what Stan Lee was going for when he and Steve Ditko created the Daily Bugle boss and Peter Parker foil: Lee often spoke about the character as an exaggeratedly cruel version of himself. But Jameson is also a deeply entertaining figure in the Spider-Man mythos, his various, florid declarations of the public menace posed by the friendly neighborhood web-slinger the kind of exclamation-pointed thing comic-book speech bubbles were made for. Any Marvel character that’s existed for as long as JJJ is bound to change with the times (hello, podcasting Spider-Man-for-PS4 version), gaining nuance and new shades and vulnerabilities along the way. But I’ll always prefer the flat-topped newspaperman’s blustery, cigar-chomping basic model, always one panel away from hoisting himself on his own petard. Stan Lee’s outspoken support of the civil rights movement and opposition to racism in the pages of Marvel comics are, without a doubt, the most important of his late-’60s achievements. But I have to say that the cosmic grooviness of Doctor Strange comics from that period is pretty great, too. That’s largely due, of course, to Steve Ditko’s mind-bending psychedelic art in those pages. But Lee’s signature corniness and love of alliteration, when applied to the realms of the occult, produced some truly charming catchphrases for Doctor Strange as well. And even with all the mystical temples and cool capes, Dr. Stephen Strange is still a Marvel character—which is to say he’s a flawed, human one. Plus, he inspired The Venture Brothers’ Dr. Orpheus, one of my favorite characters of all time in any medium. That’s a reason to love him, and all his hoary hosts and vapors of valtorr, all on its own. Stan Lee has had a hand in creating many villains, from the multi-faceted mutant revolutionary Magneto to Fin Fang Foom, a dragon that wears shorts. But none loom larger over the Marvel Universe than Dr. Doom. As one of the very first villains created by the incomparable Lee/Kirby team, Dr. Doom debuted early in the duo’s Fantastic Four run (Fantastic Four #5, True Believers - Neighborly Nick) and quickly became the foursome’s flagship foe, a mad tyrant loner Lee and Kirby juxtaposed with the close-knit team of Marvel’s first family. Like many subsequent rogues, Doom had an alliterative name, a personal connection to the Fantastic Four, and his own arrogance and personal failings usually led to his downfall. 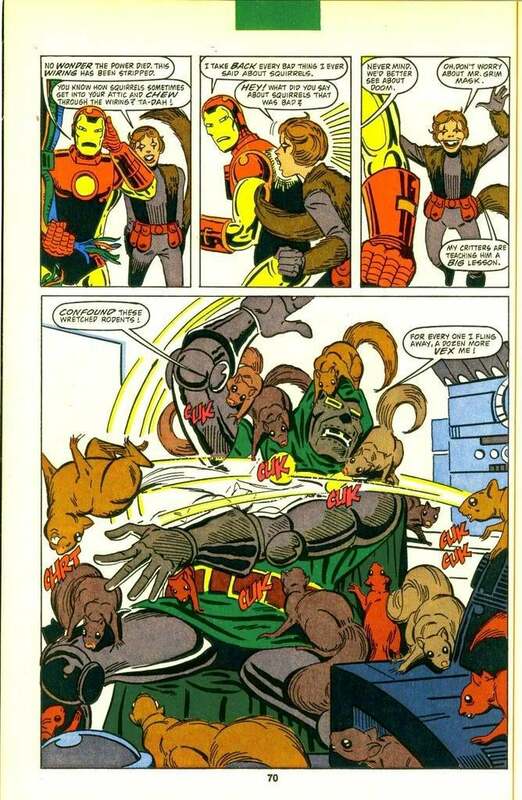 Although primarily a FF adversary, Dr. Doom has tangled with Spider-Man, Iron Man, and any hero worth mentioning, maybe most hilariously Squirrel Girl. Doctor Doom is also perhaps the most well equipped supervillain, claiming both a genius intellect to match his arch rival Reed Richards as well as the wealth and diplomatic immunity that comes from ruling his own country. Also, he’s a sorcerer who apparently once came in second place in a magic tournament—which was probably Dr. Strange’s fault, if you ask him. When I was a kid, everything changed the day I came home from school, crossed the street, and had a friend say to me, “Hey, you should check this out,” while handing me a copy of Uncanny X-Men. I had never seen anything like it: a bunch of awkward, uncertain outcasts, drawing strength from each other in order to get through life in a world that didn’t especially like them, who just happened to have superpowers to boot. For a pre-teen who often felt like the odd one out in school, it was a lightning bolt, a volcanic eruption that ripped open the pop culture I had been consuming and showed me the way to a different one, one that existed inside the pages of comics. The heroes were fascinatingly flawed, all of them given to social isolation in one form or another, and it spoke to me in a way few things have. The symbolism of the mutant heroes is powerful, which is why they’ve been used as an allegory for just about every marginalized group at this point (and were created by Lee with the express intent of functioning as such). By the time I came to the book, it was a mix of characters created by Lee and the many more who followed in his wake on the title/s, meaning his original lineup of Angel, Beast, Cyclops, Iceman, and Marvel Girl already had a lot of company. But the idea of the X-Men was always bigger than any individual superhero. It was the idea of a collective force for good, a place where those outcasts could come together and find a home among one another’s company, and not feel so alone. That’s a powerful message for a kid, and one that I soon spent long hours following, reading backwards and forwards in the comics’ history as the X-Men also became my fictional family in a way. It was a cultural gift for which I’ll always be in Stan Lee’s debt, and one that has shaped me more than I care to admit. Dammit, A.V. Club, and here I had managed to avoid tearing up until now.